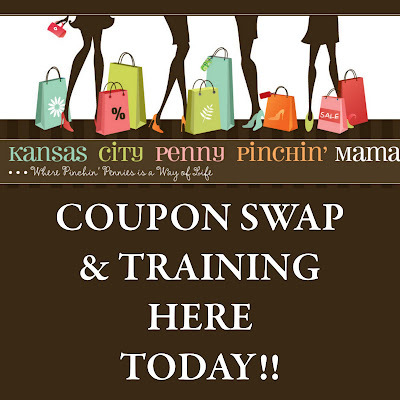 So, are you all as excited as I am about the Coupon Training & Swap this Saturday! I can’t wait to meet those you who are going to be there. This post will contain all of the information that you need to be prepared. DATE/TIME: Just as a reminder it is this Saturday, November 21st at 10:00 a.m. If some of you can come earlier and would be willing to possibly talk to the KMBC 9 News Crew (who is suppose to be there), that would be great! LOCATION: Recreation Park in Raymore, MO. The address of the park is 909 S. Madison so that you can either put it into your Garmin or Mapquest it. There is a brick house directly north of the park – that is where we will be holding this training. There will be a sign at the driveway entrance that is the same as the image at the top of this post. I will try to tie a couple of balloons to it to help you easily find it. WHAT TO BRING: Bring along a notepad and pen/pencil to take notes. Someone will be there selling the COUPONIZER that I have talked about, so if you are at all interested, you will need money for that as well. 1. Do not bring anything that expires prior to November 30, 2009. When you come in, please head to the table and place your stacks of coupons into the necessary boxes so that we will be ready to do the swap at the end of the training. COST: Free. However, I have had a few people ask me if they could make a donation to cover my time and expenses in hosting this and so, as much as I am not asking people to pay for this session, I will have a basket for any donations that anyone wishes to make. Please do NOT feel obligated to donate however. Right now, the count of attendees is higher than I ever imagined (in a good way), so you will want to arrive early to get a seat (and I apologize if there is standing room only). I didn’t turn anyone away this time since my session was free. I also will begin at 10:00 a.m. sharp, so please try to make it on time. Thanks so much everyone and we’ll see you on Saturday!! !